A Scandal in Bohemia introduced one of the most intriguing and iconic of all the secondary characters in Sherlock Holmes' world, Irene Adler. Here with a review of the short story is Maree from Life, the Universe and Cats. So opens A Scandal in Bohemia, a Sherlock Holmes short story contained within The Adventures of Sherlock Holmes. Dr Watson is happily domesticated - married, and in civil practice, when his footsteps lead him past 221B Baker Street. He calls in on his old friend, and finds him about to take on a case for the King of Bohemia that has the potential to cause a great deal of, well, scandal. A few years before, the King had become involved with an opera singer of surpassing beauty - Irene Adler. Now, Miss Adler possess a photograph of the two of them together - the only proof that the relationship happened - and she's threatening to expose the King. Enter Sherlock Holmes and his trusty sidekick and biographer, Dr Watson. 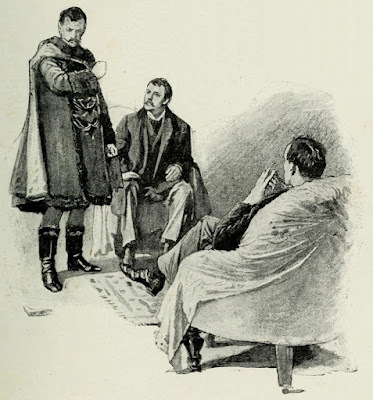 Holmes is confident that he can recover the photo and no damage will be done to the King, who is set to marry very shortly. However, Sherlock Holmes reckoned without the resourcefulness of one Irene Adler. A Scandal in Bohemia might only be a few pages long, but it's definitely an entertaining short, as Holmes goes to what might be considered extreme lengths to recover the King's photo, only to be outclassed at the last moment by the somewhat shadowy Miss Adler. We don't see a lot of her in the story as a character - she's talked about, speculated about, and there are vague descriptions, so everything we know about her is filtered through the good Doctor's memory as he recounts the story. I first read the story many years ago, as an impressionable young reader, and I've never forgotten that opening line. How I wish Irene Adler was included in more of Sherlock Holmes stories. Actually she might have had a series of her own! Imagine that: the best plans of Mr. Sherlock Holmes were beaten by a woman’s wit. I liked that story too. It was fun watching a woman beat Holmes at his own game, especially since he didn't think much of women. She was like Catwoman to Holmes' Batman.